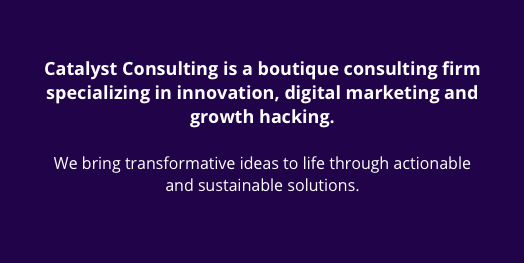 Catalyst Consulting | Transformative Ideas. Sustainable Solutions. Catalyst Consulting creates innovative and compelling solutions for organizations world-wide. Catalyst Consulting creates innovative solutions for organizations world-wide. We work side-by-side with clients on tough and complex problems, and provide strategic insights that not only unlock potential, but also create new business paradigms. Our seasoned engagement leaders can take an idea from concept to implementation, addressing both the creative demands and the operational/financial considerations. We help our clients see not only what is, but also what could be. Our clients call on us repeatedly, because they trust our expertise. Our consultants have deep operating experience, which lends unparalleled insight and pragmatism to our strategy recommendations. The discipline and rigor of our approach yields profitable solutions. We work with clients to build capacity and support new initiatives. We are a Catalyst for change, growth and profitability.